* SOLD*2004 E-Z-GO PDS electric golf car* Custom painted body and top* 6 brand new Trojan T-605 batteries* Fold down rear seat*Stainless Steel steering wheel column cover* Diamond plate rocker panels* nerf bars* chrome front brush guard*fold down windshield*carbon fiber dash* custom steering wheel*custom SS wheels/tires* lift kit* This picture does not do this golf car justice!! We carry E-Z-GO, Club Car and Yamaha golf cars. We have over 23 years experience and take pride in providing outstanding service. Come check out our large selection of new, used, and custom built golf cars. 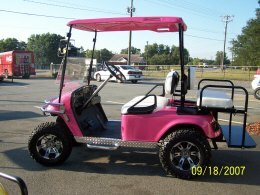 We provide our amazing golf car products & services in Hickory, Taylorsville, Newton, Conover, Lake Hickory, Maiden, Claremont, Bethlehem, Statesville, Troutman, Morganton, Boone Blowing Rock, Mooresville ,Charlotte, Lake Norman, Granite Falls, Lenoir, Shelby, Lincolnton, Denver, Davidson, Huntersville & Cornelius, NC!